^ New Nokia family of devices targeted at the business world (新闻稿). Nokia. 2005-10-12 [2006-05-28]. （原始内容存档于2006-06-18）. ^ The smallest of Nokia Eseries, the Nokia E50 business device for mobile professionals (新闻稿). Nokia. 2006-05-18 [2006-05-28]. （原始内容存档于2009-06-06）. ^ Nokia unleashes second wave of Nokia Eseries business devices (新闻稿). Nokia. 2007-02-12 [2007-02-14]. ^ Nokia E51 product page 互联网档案馆的存檔，存档日期2008-04-18. ^ Nokia E60 product page 互联网档案馆的存檔，存档日期2007-10-15. ^ Nokia E61i product page 互联网档案馆的存檔，存档日期2009-02-19. ^ Nokia E62 product page 互联网档案馆的存檔，存档日期2008-04-26. ^ Nokia E65 product page 互联网档案馆的存檔，存档日期2009-03-03. ^ Nokia E70 product page 互联网档案馆的存檔，存档日期2009-02-09. ^ Nokia E70-2 product page 互联网档案馆的存檔，存档日期2008-12-01. Nokia E62 (finally) hits Cingular. Engadget Mobile. 2006-09-12 [2006-09-12]. 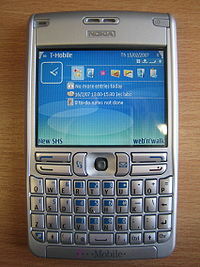 First Look: Nokia E61. OhGizmo!. 2006-06-08 [2006-06-14]. E60 photos. Flickr. 2006-06-08 [2006-06-12]. Nokia's E60, E61, and E70 E-series mobile business phones. Engadget. 2005-10-12 [2006-05-28]. Nokia Eseries. phonescoop.com. 2005-10-14 [2006-05-28]. （原始内容存档于2006年3月14日）. VoIP on the Nokia E-Series. aql.com. 2006-10-19 [2006-10-19]. （原始内容存档于2006-10-25）. How to set up VoIP with Asterisk on the E61 and E70. Christian Dannemann. 2006-12-11 [2006-12-11]. （原始内容存档于2007-01-02）.